It seems that I found something strong enough to heal a broken heart, which is almost magic. I only made baklava a couple of times and I'm not going to pretend I know everything about it. There are people who learn to make baklava throughout their lives and hopefully I'll once have good talk with one of them. But right now I can say for sure that you can make it very well from the very first attempt and enjoy both the making and the eating just extremely. When I woke up that day my first thought was that I better didn't. I was in love, madly and hopelessly. It was hard to make myself believe that I really do needed to pack and go give a cooking class. I came to the kitchen and my family reminded me that I made baklava the day before and they seriously expected "a little taste". So we cut it and had a taste. And another one. It was all moist in its fragrant syrup with it's bottom pastry layer crackling, the middle melting, rich and nutty and the top fluffy and almost crumbling. It took us over in full for some time. Then we saw one third of it gone and I felt that I could perhaps carry on. The class went well and when I came back home there was still a little of the baklava left in our fridge. I knew it was waiting just for me and nobody needed it more than I did. It actually took me no more than 40 minute preparation. Then it bakes for 40 minutes and rests for a night. To me it feels like disproportionally small effort for what you get in the morning. It makes a lot of difference to most ready made baklava (unless you get it at a really good specialized bakery). And a lot of this difference comes not from the skill, but simply from its extreme freshness. I used ready made phyllo pastry as I'm definitely not the kind of person who could make phyllo pastry by hand. Happily good quality phyllo is now easily available frozen from large supermarkets in Moscow (as it is in many other cities). Apart from the pastry you will need some mixed nuts. Combinations can be different depending on the country, shop and family (baklava seems to be made around all the Middle East and some Mediterranean countries). I prefer almonds plus walnuts, which is more Greek. But pistachio (which is more Turkish) baklava is also great and here is an inspiring article about it. Lots of butter and sugar and you are set to go. And yes you absolutely have to wait for the whole night while the baklava rests before you can dive in. If you are worried about the fact I suggest quick reading of ChefInYou and HowSweetItIs who have great tips on how to make it happend. Combine all ingredients of the filling (nuts, sugar and spices) in a food processor. If you are using a whole vanilla pod, cut it in half lengthwise, scrape the seeds out with a blunt of your knife and add them to the processor. Process till some nuts turn into powder, but there are still some 2-3 mm pieces. It is better to go in short pulses and check before you continue (otherwise you run the risk of processing them too finely). For the syrup combine the sugar and water in a medium pan. Add the cinnamon stick and the empty vanilla pod. Without lid bring to a boil and simmer for 10 minutes. Remove from heat, add the lemon juice and leave to cool. 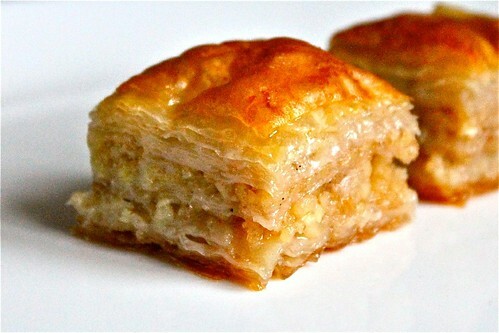 To assemble baklava you will need a rectangular baking dish approximately 36 by 24 cm. If your phyllo pastry is frozen, unfreeze it according to the package instructions. If the size of pastry sheets is much larger than the bottom of your baking dish, cut them in half so that they approximately fit into the dish. To me scissors are the best utensil here. You should get 20 to 30 sheets of the size of your dish. Brush the baking dish with butter. Place the first sheet of the pastry in it. Brush the sheet with butter. Cover with the second sheet. Brush the second sheet with butter. Cover with the third one. Continue in this fashion till you have 10 sheets in your baking dish. Spread half of the nutty filling on top of your 10th pastry sheet. Drizzle with butter. Cover the nuts with four more pastry sheets, brushing each one with butter. Spread the rest of the nutty filling on top of the pastry. Drizzle with butter. Cover the nuts the rest of your pastry sheets, brushing each one with butter. If you have some butter left, spread it in top of the last pastry sheet. If you run out of butter before you finish, melt some 30-50 g more and make sure each pastry sheet is buttered. Place the assembled baklava in the fridge for 30 minutes. Take out of the fridge and score the baklava with a sharp knife (you need to cut through the top pastry layer, but not much deeper). You can either make squares of around 3-4 cm or diamonds. Bake the baklava at 160C for around 40 minutes till the top is golden. 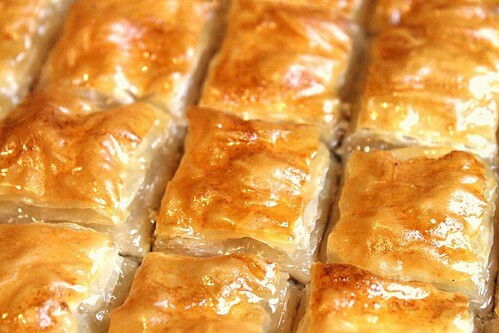 If you see the top burning too early, cover the baklava with a sheet of foil or baking paper and keep baking. Take baklava out of the oven. Pour the syrup over it. Cover with foil and let it sit for around 8 hours (overnight is best) at room temperature. During that time it will soak up all the syrup and turn into real baklava as you know it. Before that it's a complete different thing. Cut into squares or diamonds following the pattern you chose while scoring it before. Dive in and forget the world. It can be stored for up to three days, but you will hardly see it last that long. It is better not to put it in the fridge (the butter hardens there and the pastry gets too moist, so baklava looses the right texture). You did a great job, it looks almost as if my aunt made a batch!!! And I didn't know walnut was used by greeks & pistachio by turks. My mothers like to use both. Sometimes even add hazelnut in it. This looks delicious and the pictures are really helpful! Thank you! I will definitely will be bookmarking this page!